On the February 11 Venice will be enveloped in a lively, cheerful and unrestrained frenzy of the most large-scale carnival in Italy. The Venice Carnival of 2017 will continue up to "Shrove Tuesday", which this year, according to the Gregorian calendar, will be on 28 February. Masks, costumes, parades, shows on water, lights and music, carnival performances, shows for children and unique gastronomy – all of this will be widely represented at the carnival. It is hard to imagine a more exciting welcoming of spring! In addition to public festivals, you can also visit balls, masquerades and other private events at the best of Venetian palaces, restaurants and galleries. You can attend any of public events of the carnival and watch them for free (and you can easily take part in them), but for the private events, you must pay tens or even hundreds of thousands of euros. Of course, only lucky people in carnival costumes and masks are admitted to these balls. By the way, many people rent costumes in Venice. You can get acquainted with the detailed program of the Carnival on the official website: Carnevale di Venezia 2017. It is available in Italian and English. This feast will be a grand opening of the Venetian Carnival of 2017 and it will be held on the Cannaregio canal, that is located in the northern part of Venice. 6:00 – 8:00 p.m. – the opening of the festival and carnival (1 part). 11:00 a.m. – 2:30 p.m. – the continuation of the festival (part 2). 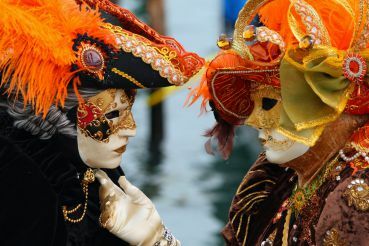 This is one of the oldest folk feasts, in which the main heroines are the 12 beauties of Venice. One of them will become the winner of the contest. 2:30 – 4:00 p.m.– Marie Parade (from via Garibaldi). 3:00 – 4:30 p.m. – waiting and greeting of Maries on the St Mark's Square (Piazza San Marco). 4:00 – 5:00 p.m. – the culmination of the celebration. 3:00 – 4:00 p.m. – the finale and awarding of the winner. One of the main competitions of the festival has a lot of stages and variations. The participation in the competition is free and you can register on the site: Carnevale di Venezia 2017. The highlight of the competition is the Children's Parade on February 27 (the time and details are to be specified at the place of the event). 12:00 – 1:30 p.m. – the opening of the competition. 3:00 – 4:00 p.m. – the continuation of the contest. 12:30 – 1:30 p.m. – the continuation of the contest. 2:30 – 3:30 p.m. – the continuation of the contest. 12 :00 – 1:00 p.m. – the qualification selection for the finals. 2:30 – 3:30 p.m.– the continuation of the selection. 2:30 – 5:00 p.m. – the finale of the competition, the award ceremony. 12:00 – 1:00 p.m. – the carnival parade (part 1). 2:30 – 3:30 p.m. – the continuation of the parade. The Gallery of Wonders is an exquisite event that you can get into only if you are wearing a mask. Tickets are available at the site Carnevale di Venezia 2017. Date: February18-28, from 9:00 to 11:55 p.m.
Venue: the Venetian palace Ca'Vendramin Calergi in Cannaregio. Price: starting from 400 euros. The waiting lasts for an hour, and the flight itself happens at 12:00. The Angel is last year's winner of the Feast of Mary. Anybody can watch the show. Date: February 19, from 11:00 a.m. to 1:00 p.m. This is a lively and spectacular show, that is available for everyone. Who is going to become the eagle of the Venice Carnival of 2017 is kept secret. The Flying Leo is the traditional finale of the Carnival of Venice. To welcome him, on stage of San Marco , twelve young ladies from Venice (“Maries”) will greet the flag. The closing ceremony of the carnival is free for everyone to visit. Date: February 28, 5:00 p.m. The detailed program of elite events and ticket prices can be found on the official website: Venice Carnival 2017 by Venice Events. Tickets for these and other activities are also available on other sites, such as: Biglietteria TMaster - ARTAcom. February 14 – Saint Valentine’s Carnival Ball at the Palazzo Contarini della Porta di Ferro (from 113 euros). February 23 – Hot Chocolate at Casino Del Contarini, at the Palazzo Contarini della Porta di Ferro (from 67 euros). 25 February – the Grand Ball "Carnival of Love" in the Palazzo Benzon (from 134 euros). 25 February – Casanova Grand Ball at the Palazzo Zen (from 207 euros). 25 February – "Doge's Ball 2017" at the Palazzo Pisani Moretta (from 828 euros). 26 February – Fancy Grand Ball "Venise the serenissima" in the Palazzo Pisani Moretta (from 507 euros).